How about a visit to the famous and amazing unfinished church Sagrada Familia, designed by Antoni Gaudi? This highly unusual church is Barcelona's most famous and most visited tourist attraction. It costs to enter the church but it doesn't cost anything to go and see the outside of it. Sagrada Familia yearly welcomes over three million visitors, so be prepared for long queues at the peak of the season. To avoid the queues you can book tickets in advance. It takes about 30 minutes to walk around and look at the church from the outside and around 2 hours to experience the church from the inside. The church was designed by the famous Catalan architect Antoni Gaudi over a hundred years ago. The first stone or brick was laid in 1882 when the area was still surrounded by big fields with goats. The church interior was finally finished in 2012 and is now open for the public, but the outside is still under construction and at 2013 about 35% construction still remained to be done. So far, eight towers and eighteen spirals has been completed. 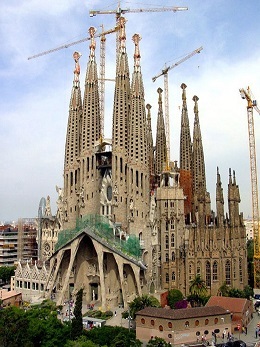 Then set date to be finish with Sagrada Familia is by 2026. Antoni Gaudi died in 1926 after been hit by a tram. If you wish to visit La Sagrada Familia you can take the metro to the station Sagrada Familia or jump on Gaudi's bus tour. The price to enter the church is between 15 to 20 euros, depending on whether you just want to see parts of the church inside or the whole church.